Winter sometimes arrives early in the Rocky Mountains of Colorado and this was one of those years. Horses from the remuda on a friend's ranch near the Great Divide had been pasturing in the high country through the summer. These horses had to be moved to the valley for the winter. I quickly realized that separating livestock from the tree-covered mountains is a talent requiring practice and patience. 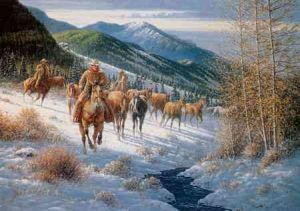 It is truly a job for the men called "High Country Cowboys."